Home | Colerain Barrel Co.
Making the Finest Barrels so Builders may Fulfill their Dreams! The Business end of a Colerain Barrel. If you have any of the following interest, then maybe, you might consider a Longrifle or Fowler. ♠ Working with beautiful wood. Such as Curly Maple, Cherry or Walnut. ♣ Wood Carving. Whether Incised carving or Relief carving. ♥ Metal engraving or Chiseled relief engraving. ♦ Wire inlays or metal inlays. ♥ To create a family Heirloom that can be handed down for generation. If interested in books on building a Longrifle, here are two I would suggest. The Gunsmith of Grenville County: Building the American Longrifle, by Peter Alexander. This can be bought many places on line. Thank you for visiting the Colerain Barrel Company. Makers of Precision, high quality Muzzleloading gun Barrels. Serving Gunbuilders for nearly 30 years. 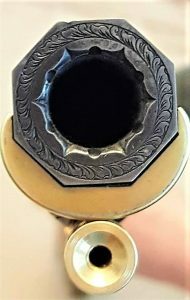 On this site I want to provide information, mainly through photo’s, about the wide range of finished Longrifles and Fowlers that use Colerain barrels. You will note that they range in ornateness from plain, which is what most in Colonial times used, to the most beautiful works of art and everything in between. As then, they are now as individual as the one that creates or uses them, no two ever being alike. Most photo’s of guns will be Linked to their builder. Our goal has always been to provide functional and historically accurate barrels. We have many styles of octagon swamped ( tapered and flared ), straight octagon and octagonal to round profiles. We offer a wide range of calibers in both rifled and smooth bore barrels. We offer standard rifling twists along with Gain Twist rifling and Turkey Choke barrels. Please see the Barrels page for more information regarding that. We are here to serve the individual client, our dealers, distributors, clubs and museums. We welcome all inquiries, and will work with those that are considering offering their own line of products, whether muzzleloader kits, custom built muzzleloaders or fowlers, replacement or repair of antique weapons, or retailing gun parts. We stand behind our products. If you have any questions please feel free to e-mail us or call. We do produce many of the Musket barrels that are used by The Rifle Shoppe . So, you are considering to enter into the world of muzzleloading. You should not hesitate because we have met some of the nicest and most helpful people ever in this sport. We have listed dealers, distributors, builders and other contacts on a separate link. Remember, help is close by.